In this innovative study, Jun Kimura integrates historical data with archaeological findings to examine a wide array of eleventh- through nineteenth-century ships from China, Korea, and Japan. Chinese junks and Japanese sailing ships were known throughout the world, and this work illustrates why their innovative designs have survived the centuries. Kimura presents an extensive dataset of excavated coastal and oceangoing ships that traveled the Yellow Sea, the East China Sea, and the South China Sea. Three detailed case studies include the Shinan and Quanzhou wrecks and the Takashima underwater site. Using travel documents, cargo manifests, iconographic paintings, and other descriptive resources, as well as the archaeological evidence of hull components, wooden timbers, and iron remains, Kimura sheds new light on East Asian shipbuilding traditions. Jun Kimura is junior associate professor at Tokai University. Kimura. . . Has ably taken on a very complex task in integrating the arhcaeological evidence, especially hull remains, into the existing nationalistic view of seafaring in Southeast Asia. . . . Highly recommended. A comprehensive inventory of the known shipwrecks and a thorough study of their diversity and evolution. It is a major source of data and a seminal work for the development of the discipline. 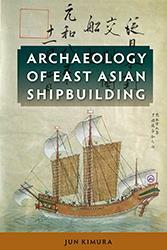 Achieves a comprehensive understanding of the region’s shipbuilding traditions that captivates non-Asian audiences and encourages new thematic research methods in the Asian archaeological community. . . . A welcomed addition to the literature of maritime archaeology and East Asian studies.